While it is no secret that the Nintendo DS has had some killer titles showing up lately, there are those of us who still feel that the little handheld is being neglected in one major area: the RPG genre. Let\'s face it, if DS owners want to satisfy their need for a good portable RPG they will have to blow the dust out of the DS\'s GameBoy Advance slot and throw in a past favorite. In an attempt to fill the void, Konami has released Tao\'s Adventure: Curse of the Demo Seal, a turn-based RPG that puts you in the shoes of a young Air Speller (a.k.a. magician) named Tao. Mondominio is a city full of monster hunters whose economy is built on the trade of monster eggs. At its center stands Monster Tower, a huge stone fortress which houses all manner of monsters. Monster hunters venture inside to harvest monster eggs to sell, the rarer of which can bring quite the pretty penny. But one day a great bolt of lightning struck the tower, damaging the seal that kept the monsters trapped inside. The great beasts spread across the land; turning any and all they came across into stone. In classic RPG fashion, enter Tao, a boy whose home island has been ravaged by monsters and is now the only one who can save the world. 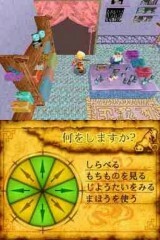 The whole game is based around climbing floor after floor of Monster Tower to find a magic egg that can save Tao\'s island. The premise is pretty simple, enter a level, fight through monsters to find the door to the next level, wash, rinse, repeat. 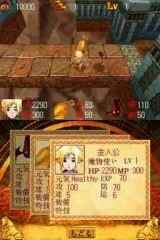 As you climb higher you will come across new and progressively tougher monsters as well as find rare and helpful items. But the real goods you are looking for in the tower are monster eggs, which you can have hatched and then use your new pets as allies in battle. Battle itself is a fairly simple turn-based system in which you either cast a magic spell or strike the monster directly, your allies attack, then the monster gets to attack you. Repeat until someone dies. You cast magic by drawing symbols on the touch screen a la Castlevania DS and then selecting a target. Unfortunately you have to draw symbols from memory, and if you forget what a specific spell\'s symbol is you have to back out of casting mode, go into your inventory, look through your spell book, then go back and re-load the casting function. While the combination of using magic, direct combat, your allies, and items in combat can make for some fairly enjoyable dungeon crawling, the rest of the game is hampered by a variety of issues starting with the most basic of actions: movement. Tao\'s Adventure is controlled exclusively and usually clunkily by the DS\'s touch screen. Walking around is done by holding the stylus on a specific part of a circle on the touch screen depending on what direction you want to go, with a double tap of the direction causing you to run. However, you can also get around via the more conventional technique of using the d-pad along with the y-button to toggle running. Perhaps some people can enjoy moving with the stylus, but why pick such an abstract method over the much more tangible and natural felling d-pad. Possibly the most mind-boggling thing about Tao\'s Adventure is why half of the buttons on the DS don\'t function at all. You can use the d-pad to move, the y-button to toggle running, and the a-button to advance conversations. That\'s it. Why couldn\'t the other buttons have been used to take some of the annoyingness out of combat, such as using the right shoulder button to quickly bring up your spell book? Note to developers: if you are going to force players to use your unique control scheme, it had damn well better be at least as good as the standard. Even simple tasks such as picking up items can feel laborious, especially if you are using the d-pad to move. Why can\'t a quick press of the a-button be used to pick up an item on the ground? I have no idea. Another feature, or lack thereof, is that you cannot look at the map of Mondominio and move at the same time. 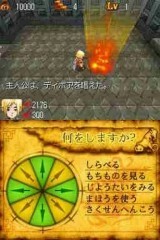 Even though the map appears on the touch screen and the top screen remains unchanged, the game simply pauses until you close the map and have a good idea of what path to take to reach your destination. Even though you can move using the d-pad, you are frozen in place. This is one of those things that makes you want to repeatedly beat a designer over the head with a can of Pringles until he begs for mercy from the mustached man on the label. Other oversights such as the fact that your inventory does not group similar items and that you cannot see what an item does until after you purchase it simply adds to the frustration that is Tao\'s Adventure. And while all of the above flaws may seem a little nit-picky if you look at them individually, when you put them all together you get a seriously flawed RPG. Yet, in spite of its numerous blemishes, Tao\'s Adventure does have a few bright spots. Graphically, the game sports a stylized look with crisp graphics that don\'t look bad at all. Characters and monsters are unique and colorful, as are houses and the town itself. But the really cool looking parts are when you get access to more powerful versions of your spells. Casting these bad boys in combat provides quite the fireworks show and can be a sight to see. Also, the light-hearted music and sound effects all sound as though they are from the SNES era, yet they suit the atmosphere of the game perfectly and really add what little they can to the game. 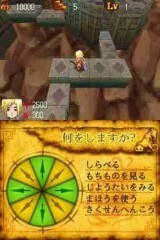 Simply put, Tao\'s Adventure: Curse of the Demo Seal is a perfect example of how not to make an RPG. Clunky, awkward controls and a whole mess of other problems ranging from the dull story to having half of the system\'s buttons serve no purpose at all make this game frustrating and irritating to play. Die-hard RPG fans may be able to squeeze some enjoyment out of this pile of wasted potential, but everyone else will be kept waiting for that good DS RPG.